Can you imagine a Guardians of the Galaxy film without its gentle giant Drax? No, neither can I.
Drax is not only a beast of a guy, but he also provides many of the film’s best comedic moments. It would be weird and a bit sad to see a Guardians of the Galaxy film without him. 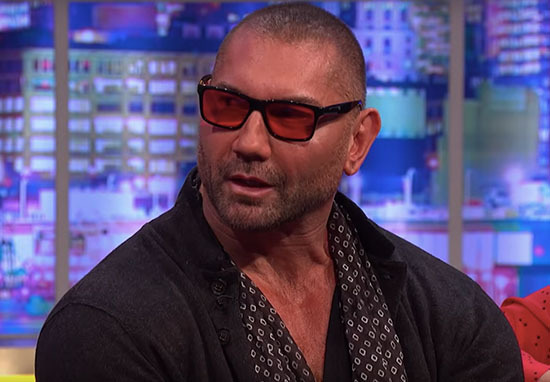 Unfortunately, it’s looking like a real possibility as, during a recent interview on The Jonathan Ross Show, Dave Bautista, who plays Drax, said he doesn’t really want to work for Disney after their treatment of James Gunn, who directed both the Guardians films. Bautista has been a vocal and prominent supporter of Gunn, who came under fire after controversial tweets made by the director surfaced. Alhough nothing has been officially announced with regards to who’ll direct or star in the next movie, plans are on hold while the situation is dealt with. It’s a bitter-sweet conversation — um, no it’s a bitter-bitter conversation because I’m not really happy with what they’ve done with James Gunn. They’re putting the movie off. It’s on hold indefinitely. To be honest with you I don’t know if I want to work for Disney? Bautista has been very open with his support for Gunn and his feelings towards Disney which, as Jonathan Ross pointed out, is ‘quite unusual in Hollywood’. I don’t think I’m your typical Hollywood guy. Bautista explained, as Deadline reports, a small crew had been assembled and had started working on pre-production for Guardians of the Galaxy Vol. 3. However, that team had been dismissed after Gunn was removed from the project. Although it’s not unfeasible to write Drax out of the series given the ending of Avengers: Infinity War, it would be a huge loss to the franchise to not see the return of the firm fan favourite. Despite the ongoing negotiations and initial dismissal of Gunn from the project, last month, it was reported a group at Marvel were attempting to reconcile with Disney to get the director back in the chair for the third film. Gunn had already finished writing the script, and pre-production was underway when the controversy around tweets – made ten years ago – came to a head. Now, with reports of rival studios circling the talented director, the cast seemingly upset at his firing, and a grassroots fan movement to have him rehired, it seems Disney may be willing to listen to Marvel and bring Gunn back into the fold. As it stands, Disney haven’t found a replacement for Gunn, nor is the director or any crew or cast member back on board yet, which puts the previously announced 2020 release date in jeopardy. With a $1.6 billion franchise on the line, Disney may be forced to take action and go back on their decision to fire Gunn, although you have to wonder whether he’d want to return at this point?